ALL SCRIPTURE PHOTOGRAPHS ARE FREE TO DOWNLOAD! ALL BOOKS AND ARTICLES ARE ALSO FREE TO DOWNLOAD! Contact me through this website if you have questions or any special requests concerning any of these scripture photographs, books, or articles. Providing beautiful Scripture photographs for free through this website is one of the ways which God has given me to bless and to help strengthen and encourage other believers world wide in our Messiah Yeshua. There are Nine Categories of photographs: Roses, Butterflies, Scenic, People, Unusual, Eagles, Lions, Sheep, Miracle Golden Photos, with multiple photographs under each category. There are now over 240 excellent Scripture photographs to choose from. Most of these photographs I have taken personally. I have combined all the photos with special bible scriptures. However, some of these photographs have been taken by my friend, Sherwood Burton. Many of my books are mainly written for the Salvation of my Jewish people, to educate them with God's Word regarding our Jewish Messiah. My books are available in English, Hebrew and Russian, and they are studies of the Holy Scriptures from the Tanakh, or Old Testament. God's Word says that our sins separate us from our God, and this Truth applies to all Jews, from the most religious ultra Orthodox Jews to the most secular Jews who do not believe in God. These books clearly prove from hundreds of Old Testament Scriptures that our Jewish Messiah Yeshua is an expression of the One God, the Holy One of Israel, who came to earth as both the Son of God and the Son of man, to offer His sinless Life in exchange for our sinful life, dying in our place for all of our sins, then rising again back to heaven. 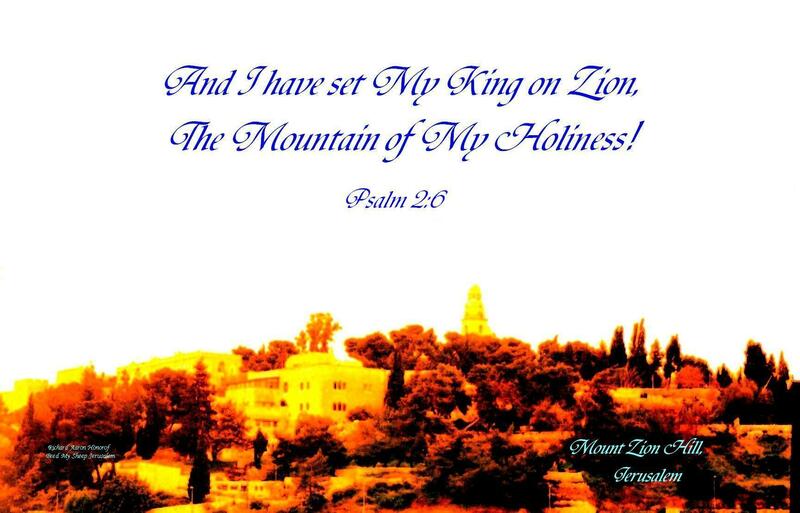 He will return soon with His Bride, reigning from Jerusalem as the King of Glory! We who have received His free gift of Salvation, have received Eternal Life forever with our God and Savior, Yeshua, the Holy One of Israel! My Books and numerous Articles are free to download. Some of my books have been sold out and are no longer available to purchase; however most are still available to purchase in English. [See Authors Books on this website.] Many of the Author's Articles are in more than one language. This Jerusalem based Jewish ministry, Feed My Sheep Jerusalem functions through donations. You can make a donation to this ministry by sending in your offering to my mailing address (below) in Jerusalem. All my scripture photographs, books, and articles are copyright ©, and property of Richard Aaron Honorof and Feed My Sheep Jerusalem, and they may not be used for any commercial purposes without prior written consent from myself, Richard Aaron Honorof, owner of Feed My Sheep Jerusalem. All my scripture photographs, books, and articles are free to download and to use. They are only for personal use only; they can be given out or sent out as free gifts to others! Click here to Contact Us through this website.